Eco-city: “This place is like a child – it’s in a development phase, but it’s chasing an ideal. It’s the kind of place where people can come to pursue their dreams.” says Wang Lin, one of the city’s residents. This 24 billion pound project which began in 2009 is part of the ambitious plan developed by the Chinese government to move 100 million people from the countryside into urban areas. The city’s location is 40 km away from the Tianjin city center and 150 km from central Beijing. By the time the project is complete – early-mid 2020s – it should accommodate 350,000 people over 30 square kilometers. But the grass is not as green as it appears to be, and what looks good on paper might be a whole different thing in practice. The Sino-Singapore Tianjin Eco-city development has made “reasonable progress” since it began seven years ago, said the CEO of its master developer. This is even though it has attracted only 20,000 residents – a fraction of the 350,000 projected to move in. Chinese authorities began encouraging the construction of “eco-cities” in the middle of the last decade; since then, hundreds have sprouted across the country. The concept of an eco-city is vaguely defined, but most of them are built on once-polluted or non-arable land. These cities must comply with stringent green architectural standards, and experiment with progressive urban planning and transportation infrastructure. The catch is that they simply may not work – if, indeed, they get finished at all. 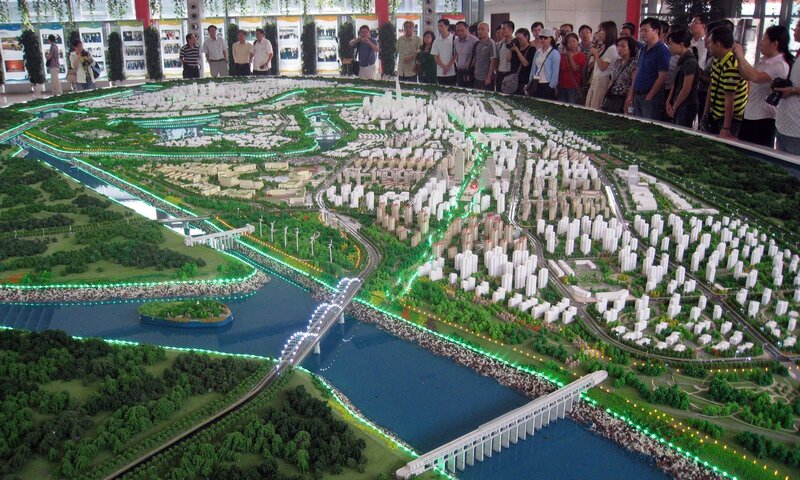 Many other ambitious eco-city projects – including Hebei province’s Caofeidian, once considered the crown jewel of the movement – have ground to a halt. It is a familiar sound in Tianjin. With support from the central Chinese authorities, the municipality has shaped its outlying areas into a gallery of showcase projects. Beyond the eco-city lies an ersatz ancient town, a free market zone with its own football team, and a half-built financial center which, according to its developers, will someday rival Manhattan. Construction is everywhere; people are scarce. At the moment, the Tianjin Eco-city feels more like a simulacrum of a viable community than the real thing. The design of the buildings complies with the world’s most stringent environmental standards, but they stand mostly unused. The future of this “child” is a blank slate and only time will tell if it will grow up to be a productive part of its society or just another burden.